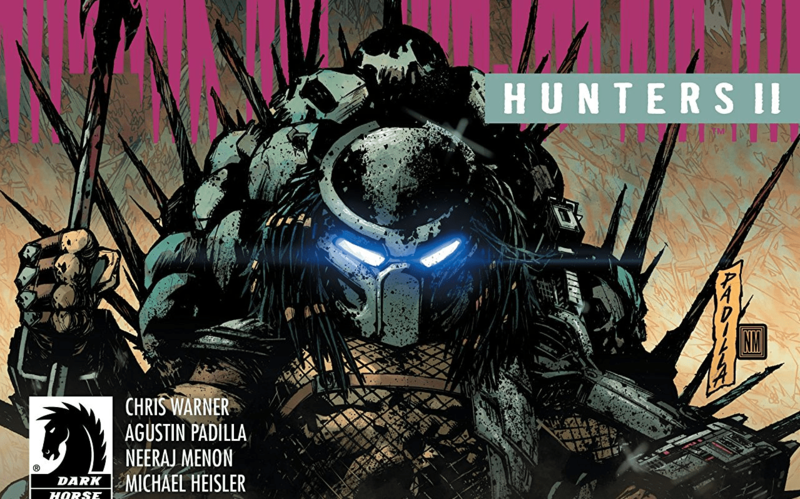 Predator: Hunters II #2 review – AiPT! Visceral and brutal but also shows some heart and depth. Predator: Hunters II #2 from Dark Horse is out this week and it continues the story of Jaya and her team of Predator Hunters pursuing one of the monsters in Afghanistan. After taking over a Taliban cave high up in the mountains, the alien creature makes its base of operations there, stockpiling trophies of weapons and skulls. A group of Jihadi converge on the cave to take it back and are slaughtered in a most brutal fashion. Meanwhile Jaya and her team pose as aid workers and arrange a meeting with the local Malik. Swain decides to stay behind with the truck while the others meet with the village elders. The villagers believe that a Djinn was sent to protect the them from the Jihadi invaders. When Jaya probes the Malik further about the Djinn she upsets him and the meeting is ended abruptly. Back at the truck a young boy named Atal approaches Swain and tells him that he knows that they are not aid workers and that they are here to hunt the monster in the caves. The young boy, who lost his parents to a Taliban attack as well as his leg to an antique Russian landmine, claims to know the whereabouts of the Predator. Atal offers to take them there in exchange for passage to Canada, away from the death and harsh conditions of Afghanistan. When Jaya and the rest of the team arrive back at the truck, Swain introduces the young boy to her. Jaya is reluctant to take him up on his offer, but after the boy pleads his case and with some convincing from Swain, Jaya seems to warm up to the idea. Suddenly some heavily-armed helicopters come flying overhead. It seems there is an American Black Ops Team, codename: Stargazer also hunting the Predator for its tech. Jaya comes clean to the rest of the team and tells them that she saw their team leader at the murder house earlier and that is why she made them leave so hastily. With everything out in the open now, Jaya explains that she is here to keep the tech out of the hands of the US military as well as the rest of the world. This has become an arms race of global proportion and not just a hunt to destroy the alien Predator. The issue ends with the team planning and strategizing a way to take out the Predator before the others get to it. The Predator stares out from the entrance of its cave surveying the land and preparing for its long Hunt as well. Chris Warner does a wonderful job on the story in this issue. Although some of the characters take a back seat this time around, it really focuses well on Jaya, Swain, and the young boy Atal. We get to see a little more of what motivates Jaya, as her family’s fortune was made using Predator tech even if it was not military in nature. She feels it is her duty and her penance to do right by her family name and keep the dangerous weapon tech out of the hands of any government that would exploit it. We also get a deeper glimpse into Swain and what Afghanistan means to him with the ghosts of his past. This is as much a story of his redemption after the events on the island. Warner also writes in new players with codename: Stargazer. Not only will the hunter team have to contend with the Predator, but now they will have to do it while trying to beat one or more military organizations to the punch. The artwork on this issue is awesome! There are truly some breathtaking moments. One panel in particular has the Predator decloaking as it stares into a sunrise carrying a bag of skulls fresh off of a hunt. Most of the creature’s body is still cloaked and you can see the sunrise through it. This image is beautiful and terrifying. It is a perfect example of the kind of talent that Agustin Padilla and Neeraj Menon bring to the table. The action scenes are brutally vibrant and the Predator rips through the Jihadi with a savage precision that can be felt on every page. Padilla’s graphic images married with Menon’s intense use of color really make the action explode. The pair also do a wonderful job making the entire look and feel of the setting of Afghanistan seem realistic. This title continues to be gritty and intense yet beautiful and breathtaking at times. Overall, Predator: Hunters II #2 is a wonderful issue in what is shaping up to be an incredible mini-series. It is visceral and brutal but also shows some heart and depth of story and character. This title is the perfect blend of story and intensely savage action and a must-have for any Predator fan. This title is the perfect blend of story and intensely savage action. This book is a must-have for any Predator fan. This particular issue focuses more on the story however the scenes with the Predator are savage, intense, and extremely visceral. Overall this is a near-perfect second issue to an already amazing mini series. This title is an absolute must own for any Predator fan.